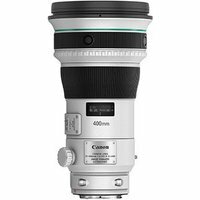 The Canon EF 400mm f4 DO IS II USM is a super-telephoto prime lens for photographers on the move. The lens incorporates a three-mode Image Stabiliser (IS) to allow the use of shutter speeds at up to 4 stops slower, which is particularly useful when shooting handheld in dimly lit environments. Inside the lens is canon's third generation Diffractive Optics (DO) to ensure superb image quality, with improved resistance to flare and coloured fringing. Power Focus technology allows pull-focus effects when shooting video and Focus Preset and Focus Stop buttons are ergonomically placed when you need them, in addition to full-time manual focus override for precise adjustment.